This is Kenson Silungwe. He is one of the first children that Just Trading Scotland was able to sponsor through donations received as part of the 90kg Rice Challenge. He is the oldest brother in a family of 9, in his spare time he enjoys fishing with his friends and is an avid fan of FC Barcelona. Thanks to the amazing generosity of people within the UK we have been able to support Kenson through every year of his secondary school education. 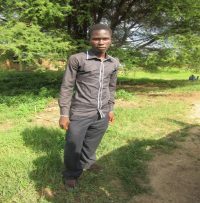 Last year when he sat his exams he was able to achieve incredibly high marks and has been admitted to Lilongwe Agricultural University to study Dairy Science and Technology. At JTS it is our passion to make sure as many children like Kenson are able to reach their potential through secondary and further education. Whether as a result of improved income through the 90kg challenge or direct sponsorship we need your help to be able to do that. Will you join fairandfunky in their 90kg rice challenge?